London: Parliament House (designs for). Unfinished design for a semi-circular ceiling showing radiating panels divided by rosettes from a central rose. You are here: CollectionsOnline / London: Parliament House (designs for). 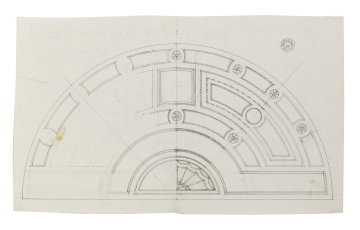 Unfinished design for a semi-circular ceiling showing radiating panels divided by rosettes from a central rose. Unfinished design in pen over pencil for a semi-circular ceiling showing a ring of large and small circles with borders decorated with arabesques. The designs on both recto and verso are probably versions of the ceiling compositions in Adam vol.7/18, 45 and 46, and can be associated with James Adam's Parliament House scheme of 1762/63. The drawing is probably by George Richardson (d. c.1813), possibly after a composition by Giuseppe Manocchi (1731-82).